The numbers have all gone a bit silly, really. Over 2700 QSOs in the log as I write this; 5300 lookups on QRZ.com (If you’re checking and you see 7800, remember to knock off 2500 from last year); and literally thousands of individual hits on the camb-hams website. 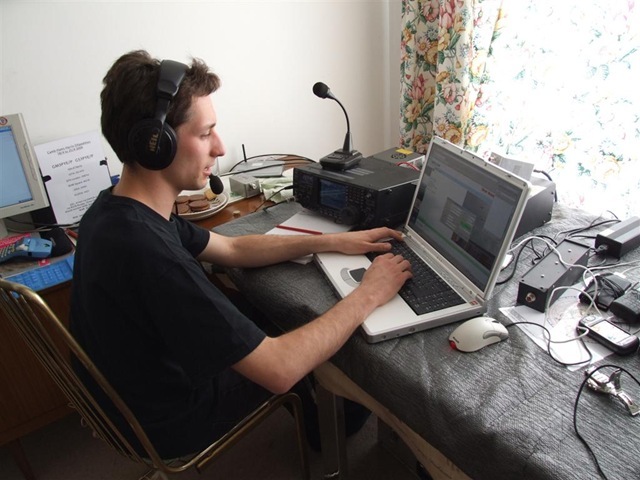 Despite a turn in the weather today we have continued our program of SOTA and WAB activations – Voi & Allan are doing a grand job between them, and at times we’ve had three HF stations running. The wind has picked up this afternoon, so we’ve had to lower the Spiderbeam and the VHF aerials, but we’ve still got HF wire aerials that we can use as well as the HF vertical. This afternoon we worked several Japanese on 20m, as well as another Australian. There are quite a lot of stateside calls in the log as well. 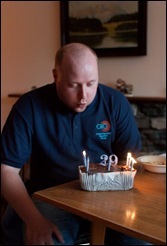 It’s Gavin’s birthday today, and he’s off to the big city of Tarbert to celebrate tonight! Someone who hasn’t been mentioned much in this diary is the legendary Rob Warner GM1SAA. Bob has had a huge amount of involvement in the planning and preparation for this trip; he & Gav built the Spiderbeam – that added up to many, many man hours between them; he has spent hours on the internet researching the cottage and the surrounding area, and buying all the necessary bits that we need on eBay. Bob towed the trailer up here (OK, I helped a bit – but he still covered the lion’s share of the journey), and he is a stalwart in the shack. If anything needs doing, or a band needs working – you can rely on Bob. Last year it was Voi who seemed to have a car boot full of everything we needed – this year it is Bob. We thought we’d lost him yesterday evening – but it turns out that he, Seamus, Gavin and Rob were outside until three in the morning trying to photograph meteors. On the subject of stalwart operators, another rare find has been "Other Rob" – MM0VFC. This young lad has clocked up more hours on the air this week than the rest of us put together. 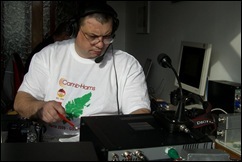 Yesterday he was left to run HF singlehandedly all afternoon whilst the rest of us went to Callanish; this afternoon he’s back on the air again. You’ll have seen earlier on in the diary that he knocked out a neat piece of logging software, as the HRD version we were using was unreliable. This software is so easy to use that even an old Luddite like me has thrown away the paper log. He’s working on v2.0 at the moment. Rob is also a member of CUWS – but we’re going to start pointing out that he is a Camb-Ham now, and we get first dibs when it comes to contesting! Nice to have a chat with you guys again tonight. Glad the trip is going so well. I will be on the next one for sure!!! Can we have some more guest blog entries too?